I wish I had something more festive…. 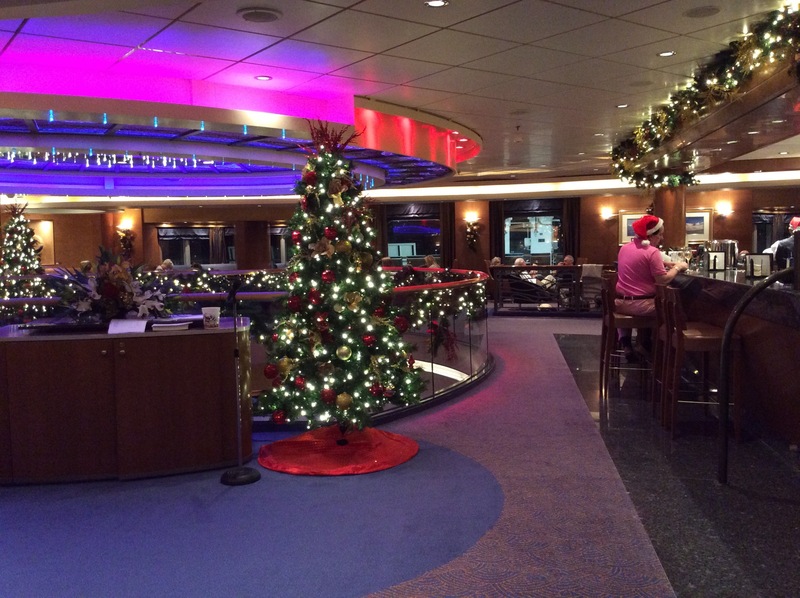 We did a Christmas cruise in 2014 on Arcadia – here’s a link to the main page about the cruise. As you can see if you read the mini-review on that page, I said “So, did we enjoy Christmas on Arcadia? Yes we did, with reservations“; and our main reservation was “First of these would be the fact that we actually feel that we’ve missed Christmas“. So last year we didn’t even look for a Christmas cruise, nor this year in fact; but here we both are, wondering if we should have. As Val said the other day “I’ve lost the magic of Christmas”. We’ve reached the stage of life where our own children long since grown up and flown the nest – one of them will be on another continent this Christmas – and we seem to spend these holidays doing the same round of visits that we do throughout the year. We don’t think we’re rich – perish the thought! – but being honest with myself, we’re certainly very comfortable. After all, we can afford to go on cruises, and if you have a look at my other blog you’ll see the number of long-ish non-cruise trips I’ve been able to afford since I retired. After we’ve done all the usual stuff this Christmas we’re going to reward ourselves with a couple of nights away in January at a 5* hotel in northern England – that will be our present to ourselves. But we’ve begun to ask ourselves if we would enjoy another Christmas cruise, and we’re beginning to think that we would. Especially as this time we would know what to expect and what we ought to get ourselves involved in. Unfortunately we know that it will probably be December 2018 before we can do a one. There’s nothing terribly suitable for 2017, and in any case with Val still working we’re constrained on the number of days we can be away. That cruise on Arcadia required Val to take just three days off work – it was Saturday to Saturday, and Christmas & Boxing days (Bank Holidays, of course) were midweek. Most of the 2017 selection would require more time than that. We’re certainly not in a position to do a 14-night Caribbean cruise over Christmas & New Year. But maybe there’ll be something for Christmas 2018. So let me ask my readers – how many of you have done Christmas cruises? Did you enjoy them? If you haven’t would you like to? And what sort of Christmas cruises? – longer ones away from the UK for a couple of weeks or more, or the shorter ones in and around the Channel and the Baltic? Please let me know what you think about this, via the comments form. Hi Tom, my husband and I were on the same Christmas Cruise as you, also our 1st Christmas Cruise. We loved it although Christmas Day itself was a bit strange as I love cooking! We are off this year doing the 9 night version again on the Arcadia as I cannot get my head around heat at Christmas! We have picked up some tricks from other passengers we spoke to and we are taking a Santa Sack of pressies so we open something each hour through the day (just silly fun things) We can’t wait and are now officially counting he days. Good to hear that you enjoyed that cruise on Arcadia, and that you’re doing it again. We did look briefly at this year’s cruise, but as it happens we knew Val would be completely out of leave before December (we had a 7 night cruise, a family holiday in Devon plus nearly two weeks in N America) so it definitely wasn’t a possibility this year. Next year, unfortunately, there isn’t a cruise of about that length. I agree with you about ‘Christmas in hot weather’ – it just seems strange. But I expect we could get used to anything, given enough practice…. Good idea about the Santa sack – we must do something similar if we go again. Southampton Sailaway: Great sense of anticipation, super atmosphere on board, mince pies & mulled wine. Christmas Eve in Cartagena, parade in town, cracking tapas lunch, having a relaxed drink in the sunshine in the port area. Christmas Eve on board: Staff Carol Concert in the late afternoon, lovely dinner, party atmosphere, Midnight Mass. Christmas Day evening: extra special dinner, party atmosphere. New Years Eve: fabulous day out in Barcelona – probably our best shore day ever, extra special dinner, party atmosphere. Not so great: missing Cadiz & Valetta due to fog (could happen anytime of course), very quiet round the ship Christmas day afternoon (understandable but we weren’t prepared for this), nothing special about Boxing Day, bit flat atmosphere around the ship until New Year’s Eve. I’d definitely do another one in time (we have a young son now so won’t be for a few years) as we’d know what to expect and could compensate in other ways (great idea about the presents Rachel!). We’d certainly do more activities around the ship Christmas Day morning then relax in the afternoon (we didn’t do anything in the morning last time and got restless in the afternoon). I don’t think we could replicate our “home” Boxing Day in any way (usually family time without any pressure of preparing dinner, sports, etc.) but there were things to do round the ship. Overall the pros outweigh the cons & I’m sure 2nd time round with more experience and better preparation would be even better. Many thanks for the comment and the evocative memories.